Looking for a new virtual volunteer project? The featured project from the National Archives Innovation Hub involves logbooks of the US Coast Guard vessels that served in the Vietnam War. These vessels participated in Operation Market Time, an effort to patrol the South Vietnamese coast to keep supplies from reaching North Vietnamese Army and Viet Cong forces. The logbooks contain the highlights of each ship's voyage, written up every four hours by the deck officer on watch. Information recorded may include incidents of shots fired, transportation of detainees, and contact with friendly or unfriendly vessels. These logbooks have been scanned by citizen archivists and now we are looking for your help to tag and transcribe these records! 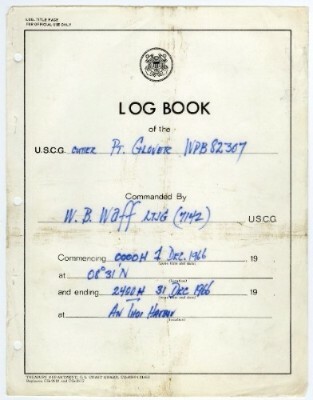 Many veterans of the Vietnam War use these logbooks today to help establish their eligibility for veterans' benefits. Get started today. Help us tag and transcribe these records on the Citizen Archivist Dashboard. Do you live near Washington, DC? Come scan with us! Join volunteers in the Innovation Hub at the National Archives to help scan these logbooks of US Coast Guard vessels. Our volunteers have scanned 4,200 pages so far, which is about 5% of the project. Join us and help veterans access the history of the ships they served on by scanning and transcribing logbook pages.